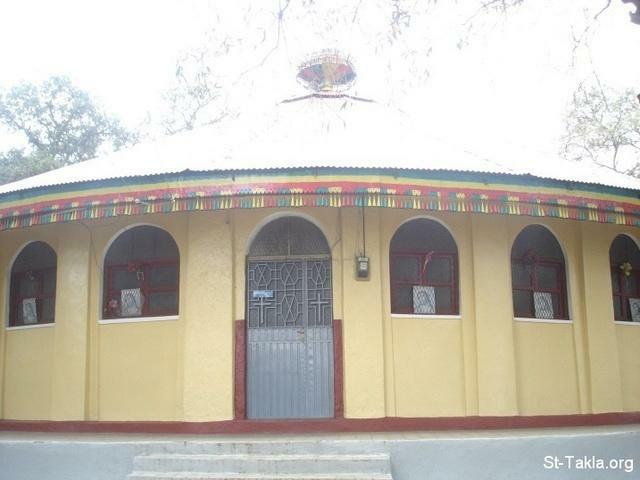 Then I took a cab to go to Azazo Saint Taklehaimanot Church in the Azezo area.. After I got there, I learned that it was a bit far from that area, I took a cabriolet, then walked for half an hour, then I found it closed.. I was told as usual “kulf yellem” (there is no key).. And I have to get there at a time that the Church is open at.. Although I did wake up very early to go to Churches before they were closed..
بعد هذا أخذت عربة للوصول إلى كنيسة أزازو تكلا هيمانوت في منطقة Azezo.. وبعدما وصلت علمت أنها أبعد عن المنطقة، فأخذت عربة بحصان، ثم قمت بالسير نصف ساعة، ثم وجدتها مغلقة.. وقالوا لي كالعادة "كولف يلِّيم" (مفيش مفتاح).. وينبغي أن آتي في وقت تكون فيه الكنيسة مفتوحة.. على الرغم من أنني استيقظت باكراً جداً للذهاب إلى الكنائس في قبل أن تُغلَق.. These shots were took on the way to Azazo Takla Himanot Church, that was closed!